Seminars and coaching sessions are certainly subject to personal tastes and comfort levels. You may need to take it more slowly, step-by-step. 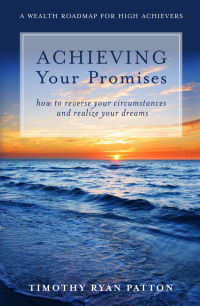 If you wish to get started on the road to success, consider buying the book, Achieving Your Promises - How to Reverse Your Circumstances and Realize Your Dreams. In the book, author Timothy Ryan Patton accounts how he returned from a devastating car accident in 1991 after being in a coma for seven days. Upon awakening from the coma he was paralyzed and had to relearn math skills. He felt like a child again. He spent the next nine years of his life recovering from injuries received in the accident. Based upon a promise he made to himself he is determined to reaching all his promises. Now fully recovered Timothy shares his secret to helping you achieve your dreams and reach your promises. He continues on to strengthen his purpose in life. Patton uses the experiences he has gone through and the lessons he subsequently learned to help others who are experiencing similar challenges. Whether you decide to purchase the book is up to you. If you sign up for the list on the right hand side of the home page you'll receive a free 236 page e-book. You have the opportunity to make decisions in life that affect your future. Taking that next step by purchasing Timothy's book may be your first, or next step on your journey.